I hope that the title of this post isn’t deceiving… I didn’t use the plate three times in a single manicure or anything like that. I was just trying to be cute and clever and thought that since this is my third time using the plate, I could pull off a vague, poor musical reference (Yeah x3 by Breezy). Plus I didn’t really know what to call this manicure, and this is all that came to mind. 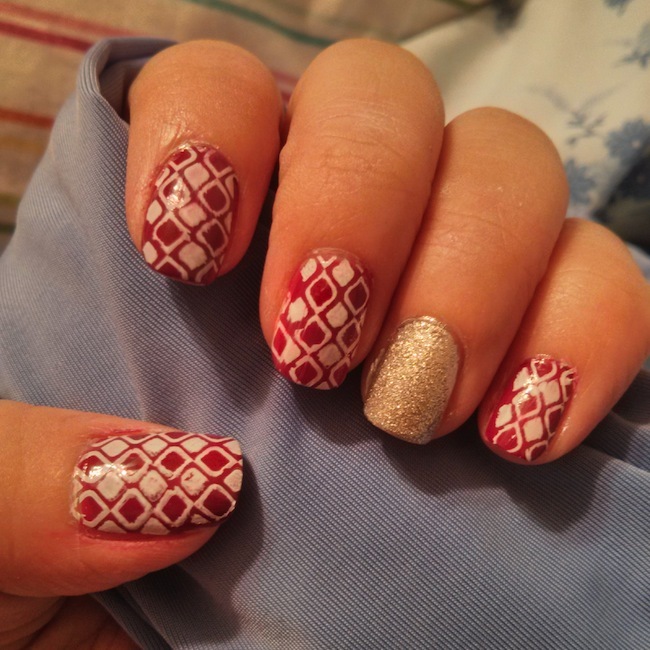 *Instead of using a stamping polish, I usually go with a standard white polish, but that won’t EVER happen again! I’m not sure if you can tell, but in comparison to my other manicures, the white this time around is much more vibrant and opaque! People aren’t lying when they say to invest in a quality white/black stamping polish. As you can see in my manicure, I didn’t let the stamping polish dry enough or the thin fast dry top coat smeared the design. I found that when I used the base coat, which is thicker, first, there was less smearing. Evidently, I have some serious issues with this, so if you have any recommendations on the best top coats to use or any techniques, let me knowwwww!! Again, sorry for getting this post out a week late (on the bright side, it was posted on time on insta ;))! School’s just been crazy and so freaking demanding D:< I hope everyone enjoys the next few days of the week and has a great weekend! Yeah, I need to get a stamping polish stat, at least white and black ! I like the accent nail with the stamping, nice. Ahh that’s great! How are you liking it?